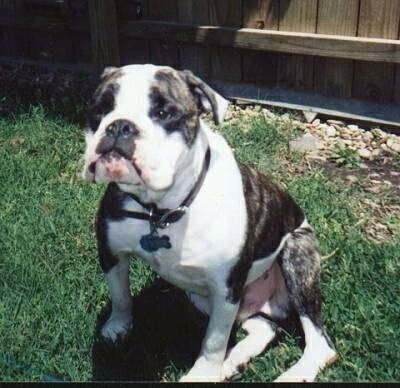 I have been told that Spike is what you call a "throwback," a glimpse of the past as to what the English Bulldog used to look like in the 1800s. 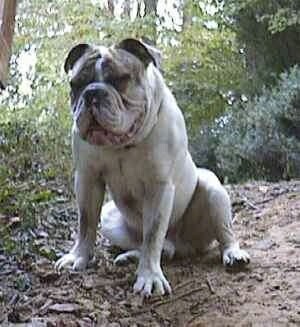 So far, this purebred English Bulldog is a very healthy dog, with no health problems at all. 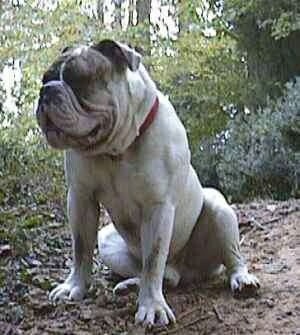 He is very athletic and able to run quite fast for an English Bulldog. Spike gets daily vigorous exercise with his best friend Puppy (the Husky mix). Spike is very obedient and loves everyone! Spike is always by my side no matter what part of the house I'm in. At Spike’s last vet appointment he weighed 70 pounds. He is 19 inches from the ground to the shoulders. Compare that to Puppy the Husky, who weighs all of 55 pounds. Puppy the Husky is a very gentle dog. He loves to play with Spike and explore in the woods. His favorite pastime is chasing chipmunks under the ivy bank. 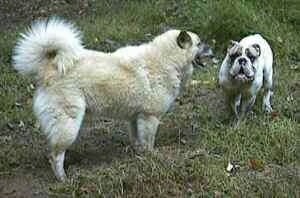 You would think with a 70-pound Bulldog and a 55-pound Husky mix, the Bulldog would be "Top Dog". But seniority takes its toll, and 13-year-old Puppy is clearly "Top Dog" over 3-year-old Spike. It is funny when you meet the two; Spike is so overbearing, almost knocking you down from excitement, and Puppy is very gentle, almost seeming weak compared to Spike. Spike tends to be aggressive with strange dogs, while Puppy is very friendly. Yet Puppy, the gentle, dog-friendly one, keeps Spike right in his place. Update 2003: Sadly, Puppy, Spike’s friend passed away at age 14. We since have adopted more dogs and Spike now lives with a Boxer and two Great Pyrenees. Spike is the oldest dog in the house and is clearly the boss among the other dogs. At 5 years old, Spike now weighs 75 pounds. 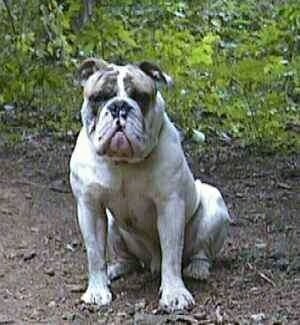 Meet BJ (Stewarts Big Jake), an English Bully. He too is a throwback to the older breed style. BJ is 18 months old and weighs 70 pounds. He is 23 inches tall. He has a 19-inch neck and a 31-inch chest. He loves large bones like Spike and gets his woes from the cat box!